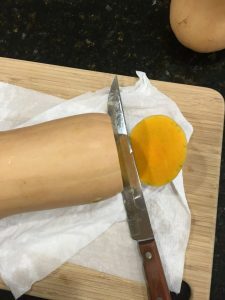 Love Butternut Squash, then learn a quick and easy way to cut a butternut squash. Butternut Squash is a healthy and delicious Fall vegetable. A pear in shape vegetable, Butternut Squash has a sweet, nutty flavor. 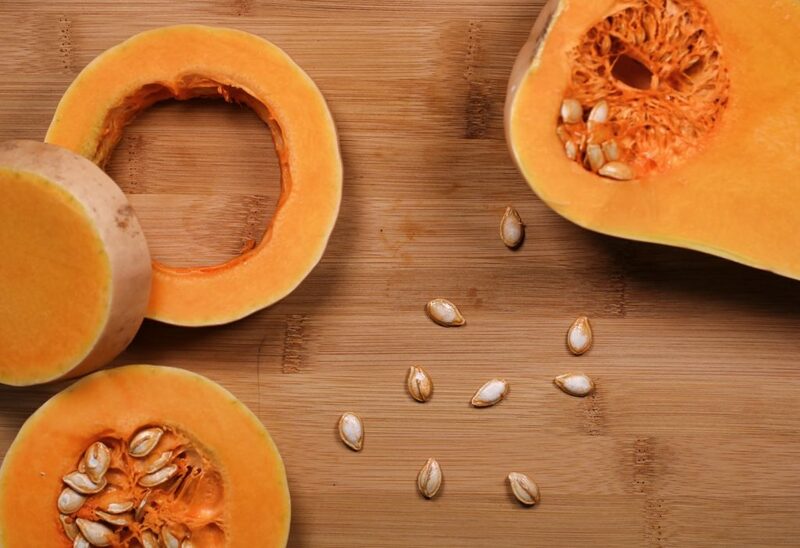 Loaded with Vitamin A, Butternut Squash is a good source of fiber, potassium, and magnesium. Best of all, it tastes so good! Your local grocery store has plenty of ready to cook cut butternut squash. Prepackaged, cleaned, and cut down to size. Of course, you never know when exactly the butternut squash was prepared. It could have been on the shelf for a few days or even up to a week. Save money by cutting your own butternut squash. Then, you’ll know exactly how fresh it is. It’s easy and quick. Take a look and I’m sure you’ll agree that it’s worth a try to save on your grocery store bill. A vegetable that is fat-free, cholesterol-free, and sodium-free. But who cares? It tastes so good! Even your kids will ask for seconds. Lay squash on its side. Remove the top with the stem. About 1/4 inch slice. Then, turn squash around on its side. Remove the bottom of the squash. About 1/4 inch slice. 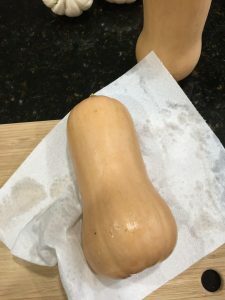 With the squash on its side, cut a Butternut Squash in half. Cut between the neck and body. This is where the lower rounded section meets the longer upper section. Stand the longer part of the squash in an upright position. 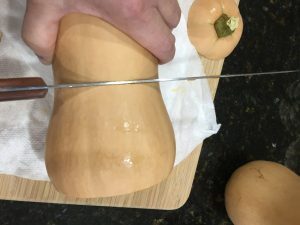 Carefully cut the skin peel away from the squash. 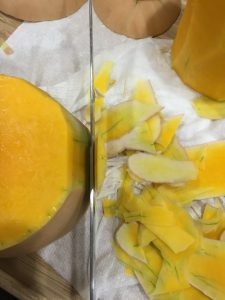 Continue removing the peel around the squash until all the outer skin has been peeled. Next, work on the second half or lower half of butternut squash. Place the lower half standing on the cut side. Again, carefully cut the skin peel away from the squash. Peel the skin around the squash until all the outer skin has been removed. You are almost done. Just a few more steps then you’ll be ready to cook the squash! 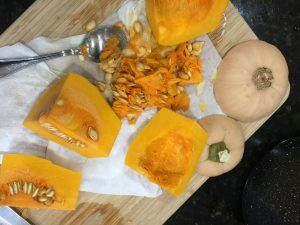 Next, take the peeled butternut squash and remove the pulp and seeds from the lower half of the squash. I use a spoon to scoop out the pulp. 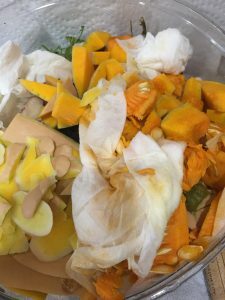 Save the pulp, seeds, and butternut squash peels to add to the compost. Rinse the butternut squash. Cut both sections into smaller pieces. I cut the freshly peeled butternut squash into 1 to 2 inch chunks. The smaller pieces will cook in less time. 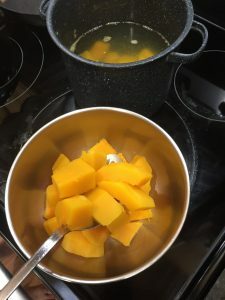 Add the freshly cut butternut squash chunks to a stock pot. Fill stock pot with water enough to cover the squash completely. On the stovetop, cook a small to medium size butternut squash for about 20 minutes on medium heat. A large butternut squash may take up to 30 minutes to cut. 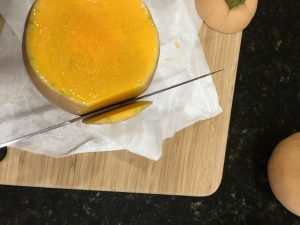 If you are cooking several butternut squash, then adjust cooking time to a longer period of time. You may need to add more water as the squash cooks, if the water level falls below the squash. Cook cut butternut squash until the squash is tender and can be mashed. 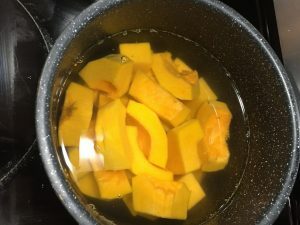 Remove the cooked squash from the heat and stock pot. Place cooked butternut squash in a prep bowl. Mash the cooked butternut squash. As you mash the squash, it releases water. Try to scoop out whatever excess water you can. The cooked Butternut Squash is ready to season or add to your favorite recipe. 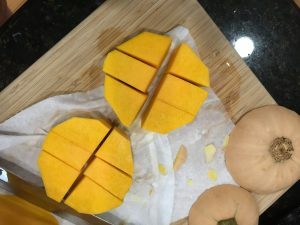 Easy Spiced Butternut Squash recipe. Be sure to save all your kitchen scraps. Add all pulp, seeds, peels, top, and bottom of the Cut a Butternut Squash to the compost. Bury the squash scraps in the center of the compost. If you do not have a compost and would like to start one, it is easy. Read our post “How to Save Money on Soil by Starting A Compost“. 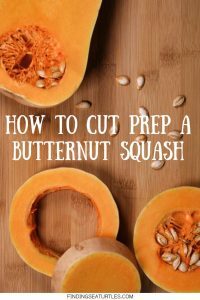 If you have any questions about prepping butternut squash, let us know in the comments below.